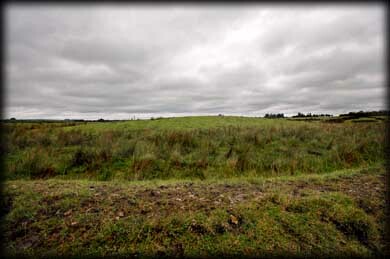 The huge ring barrow in Glenballythomas townland is one of the largest earthworks in the Rathcroghan complex. It is approximately 85 metres in diameter and consists of a low mound surrounded by a 2 metre high bank with a deep ditch. 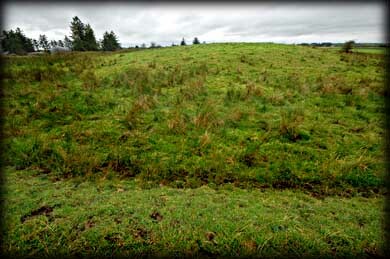 This was another ancient celtic site and is associated with the Battle of the Bulls in the legendary tale Táin Bó Cúailnge. 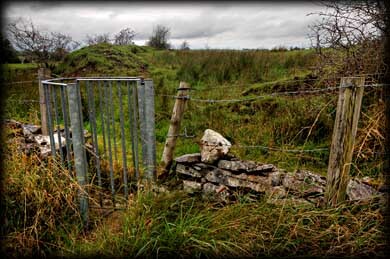 It is where the brown bull of Cooley Donn Cuailnge is said to have defeated the white horned Finnbennach of Connacht. Considering the history and myth attached to this place, I was sorry to see the neglect at this royal site, especially the entrance gate. Don't let this put you off visiting this enormous earthworks. Situated: From Tulsk head north on the N5. 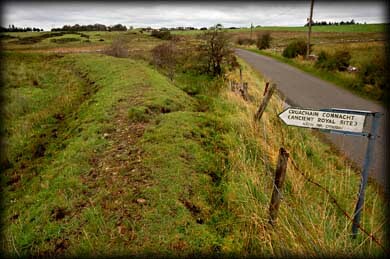 Rath Cruachan is situated about 2 k north of here in Toberrory. Take the first left after Rath Cruachan. Rathnadarve is about 300 metres down this road on your right. Discovery Map 33: M 7938 8369. Last visit Sept 2011.